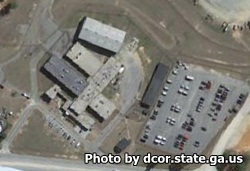 Richmond County Correctional Institution is located in Augusta Georgia. It is a medium security institution that houses 220 adult male felons. The inmates sleep in an open dormitory setting, unless they are in administrative segregation, in which case they are housed separately. Selected inmates can work off institutional grounds in labor support positions for the department of transportation, parks and recreation, roads and bridges department, animal control, landscaping, the county landfill and other county agencies. Offenders can participate in vocational programs that include construction, landscaping, culinary arts, barbering, and laundry services. Counseling is available for all inmates, and a re-entry program helps prepare offenders for their upcoming release. Inmates can also earn a GED while incarcerated. The visiting hours for this correctional facility are currently unknown, contact the institution for more information. If you know the visiting hours please leave a comment below.